GAZA CITY (Ma’an) — Israeli tanks fired several shells at Palestinian farmers in the northern Gaza Strip Saturday, witnesses said. Locals told Ma’an that farmers fled their fields east of Beit Hanoun after hearing the shelling. Also Saturday, Israeli media reported that three rockets fired from Gaza exploded on the Palestinian side of the border with Israel, without causing casualties. A spokeswoman for the Israeli army said she was not familiar with either incident. In the Qalamoun region between Damascus and Lebanon, fierce fighting continues, with possession of territory ebbing and flowing between the 2 sides. Electricity and telecommunications, including the Internet, have been down for some days. As of this morning, Saturday, Assad’s troops appear to be in Nabek, arresting local elders and earlier reponsible for killing 17 people in a shelter, including children. The bodies were found in the Al-Fatah district and it is currently not clear how long they had been dead, prompting calls for immediate access by the International Red Cross to assess the situation. There were also reports Thursday that Nabek had been the target of a chemical weapons attack after 2 shells hit the town and 7 men were reported by activists as having swollen limbs and foaming at the mouth. The Syrian Government denies that chemicals were used. The nuns say they are in “good health” and are said to be staying in the home of Christian. Other reports suggest that an Opposition group, describing itself as “Free Qalamoun”, has demanded the release of 1,000 female prisoners held by Assad in return for the nuns safe passage to freedom. Elsewhere in the Damascus region, Opposition fighters seem to have made extensive gains in Eastern Ghouta, taking control of Qasimya, Baharia, Jarba, Qaysa, Abbadeh and on the edge of Otaiba, not far from the International airport. From the northern suburbs of Aleppo there are many reports today, Friday, of Opposition fighters very rapidly driving Assad’s troops from the Al-Kindi Hospital which they have been using as a barracks. Fighting over the last 4 days has been intense, with the Opposition co-ordinating attacks from several directions and the regime striking back with jet attacks on Opposition positions. Latest reports say that Opposition fighters are in control of the eastern half of the building – or at least what’s left of it. Elsewhere in Aleppo, Opposition fighters detonated a mine near the Palace of Justice, HERE: and destroyed 2 tanks south of the Sheikh Saeed neighbourhood. Continuing power blackouts have been reported in large parts of the city, possibly because the Jihadist group Islamic State of Iraq and Levant (ISIL) is now in charge of the thermal power plant on the eastern side of Aleppo. On Wednesday activists reported that as many as 30 members of Liwa Abu al-Fadhal al-Abbas Shia militia & Hezbollah were killed in the Al-layramoon suburb of northern Aleppo and that Opposition fighters had retaken the Ikthar Laboratory building there, which is not far from the Palace of Justice mentioned above. 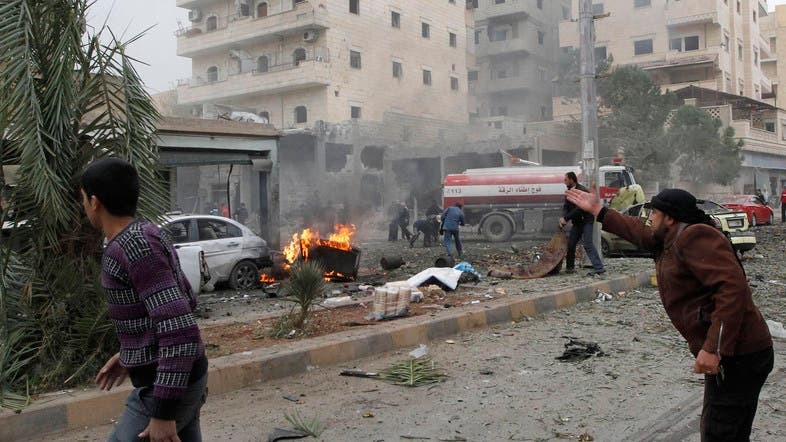 Additionally, an Opposition rocket that landed in the pro-Government districts of Furqan and Meridian in western Aleppo on Wednesday is reported to have killed 18, including 5 soldiers, and wounded 30. Similarly, in the Aleppo countryside, a Syrian Air Force air strike on Baza’a, a suburb of Al-Bab, on Friday is reported to have killed 21, including 6 children and 5 women. 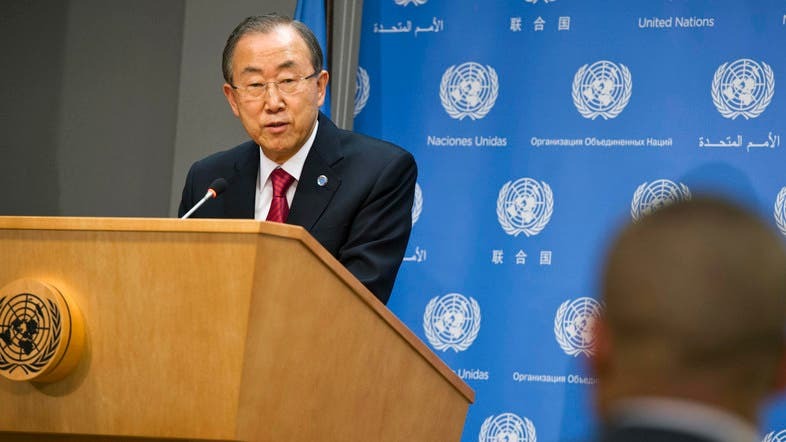 United Nations Secretary-General Ban Ki-moon speaks to the media at the U.N. headquarters in New York Dec. 5, 2013. Ban Ki-moon, the U.N. Secretary General, said Saturday that the Syrian government and the opposition will be sent invitations for the Geneva II peace conference on Dec. 20, Al Arabiya News Channel’s Paris correspondent reported. The U.N. chief said he would meet on Sunday with U.N.-Arab League envoy Lakhdar Brahimi to discuss details of the peace conference, due to be held on Jan. 22. “We will work to form a transitional government with executive powers as decided during the Geneva I conference,” said Ki-moon, who is currently in Paris for a two-day Africa-France summit that concluded on Saturday. The U.N.-backed Geneva II peace talks aims to bring representatives of Syrian President Bashar al-Assad’s government and the opposition to the negotiating table in a bid to end the bloody 32-month civil conflict, which has so far claimed 126,000 lives. The opposition has agreed to attend the talks on condition that they lead to a transitional period excluding Assad and his regime. But government officials and their Iranian and Russian backers insist there should be no preconditions, with Assad having expressed his wish to run for president again next year. Syrian Deputy Foreign Minister Faisal Muqdad said last week that no solution will be agreed with Assad’s approval. The proposed talks come amid rising international fears of an Islamist takeover in Syria. 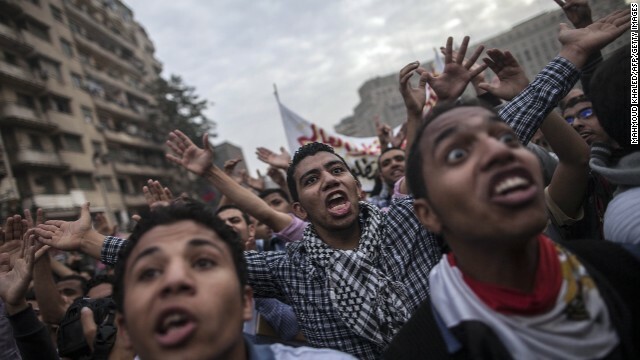 Students backing Mohamed Morsi shout slogans during a demonstration on December 1, in Cairo. (CNN) — A group of 14 women jailed for protests in support of Egypt’s ousted president will soon be free, after an Alexandria court revised their 11-year sentences, state news reported. The women had been sentenced Wednesday — along with seven minors facing juvenile detention — on charges of gathering, thuggery and weapons possession at a demonstration in support of former President Mohamed Morsy. The sentence sparked wide criticism of the Interior Ministry and the judiciary’s handling of cases involving those detained for publicly backing Morsy, who has been in custody since being pushed out in July. It also set the stage for Saturday’s appeals hearing in Alexandria. That ended with the court’s decision to release the 14 women, giving them instead suspended one-year sentences, according to Egypt’s state-run Al Ahram newspaper. The appeals court also acquitted the detained girls, who ranged in age from 15 to 17. Egypt has been mired in political and social turmoil since massive, peaceful protests in 2011 — amid the broader Arab Spring movement that targeted many entrenched leaders in the Middle East — led to the exit of longtime leader Hosni Mubarak. Morsy took power as Egypt’s first popularly elected president in June 2012. But his time was marked by continued unrest, much of it targeting him and the Muslim Brotherhood, the once-banned Islamist organization that he once led. Conditions in the North African country have not improved significantly since the military forced off Morsy and assumed control. Authorities have taken various steps to quell the social unrest, including legislation passed last month barring unauthorized protests. These efforts have most noticeably targeted Morsy supporters, though authorities have increasingly cracked down on non-Islamist activists who oppose the military-led regime and Morsy. On December 5, 2013, the United States government announced that it has sent Djamel Ameziane from Guantánamo to Algeria against his will, and despite his well-founded fear of persecution. CCR is calling for his immediate release and calling for the Algerian government to respect and protect his human rights. If you are outside the United States, please call the Algerian Embassy in the country in which you live. You can find the number on the Algerian Embassy website. Djamel ended up in Guantánamo in the first place because he was a refugee fleeing persecution in Algeria, a journey that took him across three continents and ended with him being sold for a bounty to the U.S. military. Djamel remains an innocent man who the U.S. government wrongly detained at Guantánamo for over a decade without any charge, who was cleared for release by both the Bush and Obama administrations, and who should have been resettled in a safe country where he could rebuild his life. Instead, in the cruelest of fates, he has been forcibly repatriated to the very place he has spent two decades trying to flee. Please act now, and urge your friends to act as well. Djamel’s safety depends on it. The Gaza Strip remains without electricity and fuel for the upcoming winter as the Israeli regime steps up the pressure on the Palestinians in the besieged enclave,Press TV reports. Only six hours of electricity per day and no gas makes most of Gaza’s homes cold for the winter. In the past few months, electricity has been rationed and also blackouts have increased during rainfalls. “Homes in Gaza lack enough heat to deal with the situation… People here in Gaza try to get some fire wood to heat their homes and this causes health problems,” said Ashraf Shannon, Press TV’s correspondent in Gaza. Over 160 Palestinians, including women and children, were killed and about 1,200 others were injured in the Israel’s eight-day offensive on the coastal enclave, which ended on November 21, 2012. New Delhi: India on Friday reiterated its support to the Palestinian cause and said it had started issuing visas from its office in Ramallah, Palestine. Minister of State for External Affairs E Ahamed said India was perhaps the first country from South Asia to lunch a visa centre in Ramallah. This facility started in September. He was speaking on the occasion of the International Day of Solidarity with Palestinian People. “With this, Palestinian nationals will be issued visas within two-three working days,” he said. “Indians have always placed Palestine close to their hearts,” he said. Ahamed said since the Indian representative office opened, New Delhi had extended technical and economic assistance to the Palestine National Authority for humanitarian relief, development work and education. During Palestine President Mahmoud Abbas’ visit last year, India pledged USD 10 million as budgetary support to the Palestinian authority. India was also helping construct schools and setting up an IT centre and a vocational training centre in Palestine, Ahamed said. India contributes annually USD 1 million to the UN Relief and Works Agency for Palestinian Refugees in the Near East (UNRWA). Alongwith Brazil and South Africa as partners, India is also implementing developmental projects in Palestine, he said at an event organised by the Indian Council of World Affairs (ICWA) here. India will continue to support Palestine’s bid for full and equal membership of the UN, Ahamed said, adding that India welcomed the efforts by Palestine and Israel to resume direct peace talks. Adli Hassan Shaban Sadeq, Palestine’s ambassador to India, said his country looked forward to a stronger role from the Non-Aligned Movement and BRICS (Brazil, Russia, India, China and South Africa) “with India in the forefront” in the Palestinian issue. He said the situation in the occupied territories was “not viable for peace” as the gap between Palestine and Israel “was widening due to the blatant violation of international law by Israel”. Rajiv K Bhatia, the director general ICWA, said there was a “pressing need for crafting and promoting consensus within peoples, states, the region, and among the major international players who have a direct stake in West Asia”. The Popular Front for the Liberation of Palestine marked the 46th anniversary of its founding with a mass rally in al-Katiba courtyard in Gaza City, with tens of thousands of participants, including leaders, cadres and members of the Front, women’s, student and youth organizations, with the participation of representatives of the national and Islamic forces. Large images of the General Secretaries of the Front – the founder, George Habash (Al-Hakim), Abu Ali Mustafa, and imprisoned General Secretary Ahmad Sa’adat – adorned the banner at the front of the stage, as well as the image of national martyrs and leaders Yasser Arafat, Fathi Shikaki and Sheikh Ahmad Yassin. Banners were draped on the walls, calling for Palestinian national unity, and resistance, and saluting the Front’s history over 46 years. Performers played national Palestinian and PFLP songs and danced dabkeh, traditional Palestinian dance. Comrades Hani Thawabteh and Shireen Abu Oun chaired the rally, at which Comrade Jamil Majdalawi delivered the keynote address. He saluted the martyrs, the prisoners, and the masses of Palestinians at home and in exile, particularly those in Jordan, Lebanon and Syria facing continued repression and new displacement, and to our people in the Naqab who are confronting the Prawer plan, the new Zionist scheme to displace Palestinians. Majdalawi said that over the years, the harvest of the Palestinian national movement has not reached the great sacrifices or the goals of our people, and all of our forms of resistance have been weaker than they should be and can be, which only exacerbates the imbalance of power in favor of the Zionist enemy. He described internal Palestinian division and lack of national unity as devastating to the Palestinian movement. In addition, the Palestinian Authority’s return to the dangerous and futile negotiations with the Zionist enemy in open rejection of Palestinian national consensus is particularly damaging. Instead of negotiations, what is needed is resistance in all forms and the implementation of our people’s rights to return, self-determination and national liberation, Majdalawi said. He saluted the ongoing steadfastness of the Palestinian people, which will be what secures the victory of our people over the criminal enemy. He particularly saluted the steadfastness of our people in Jerusalem, the capital of Palestine, in all of its forms to confront the enemy and its continuous plans. Support for the struggle of our people is growing inside and outside Palestine; hundreds of international activists confront soldiers and illegal settlers beside the steadfast Palestinian people and various levels of political, cultural and economic struggle are taking place around the world. Majdalawi highlighted the ongoing siege on Gaza which is denying access to the most basic necessities including food, medicine, building materials and fuel, causing an electricity crisis in the sector, and transforming the area into a massive prison due to the ongoing, prolonged and repeated closure of the Rafah crossing, the only exit for the Palestinians of Gaza to the outside world. This comes in addition to mass unemployment and the drinking water crisis, attacks on fishers at sea, and the retreat in services by the UNRWA, when refugees are over two-thirds of the population in Gaza. Majdalawi said that there is a decline in the grip of the United States over international affairs, and this weakening of the leader of imperialism and injustice in the world will necessarily mean an increased weakness in the enemy camp that supports and sustains the Zionist aggression on our people, emphasizing that the US is still the primary economic and military power in the world and that there are long years of struggle to come by the people and exploited classes of the world to defeat imperialism and achieve justice and equality. On the Arab level, Majdalawi expressed support for the democratic process in Tunisia and the importance of protecting pluralism in Tunisia, warned of the dangerous exclusivity taking place in Egypt that must be discarded in favor of pluralism and democracy for all, and expressed his standing with the Syrian people in the struggle for a united Syria, with democratic freedoms and equal rights for all Syrians and their political and social forces without discrimination, in addition to our stand against external interference which aims to destroy the potential of the country’s future and sink the country into the morass of obscurantism, as supported by the U.S. imperialists and their allies. Majdalawi announced that the Front has just completed its seventh national conference. Several historic leaders of the Front have stepped down from their positions and did not put their names forward in the elections at the conference, in order to support renewal in the organization and to prevent ossification and bureaucracy, including comrades Abdel Rahim Mallouh, Younis al-Jalou, Abdelaziz Abu Al-Qaraya and himself, Jamil Majdalawi. He concluded by calling for progressive and democratic Palestinian forces to come together to build resistance and unity and mobilize the people towards victory. UNICEF has joined the World Health Organization (WHO) and partners to launch a huge immunization campaign against polio in Syria. 7 December 2013 – Healthcare workers in Syria must be protected, senior United Nations humanitarian officials have said issuing a fresh call for the protection of medical facilities and for safe access to medicines, vaccines and other vital humanitarian aid in the country. “It is of the interest of both parties in the conflict and of all Syrian people to preserve the neutrality and the functionality of health infrastructure,” UN Emergency Relief Coordinator Valerie Amos, Director-General of the UN World Health Organization (WHO) Margaret Chan, and Executive Director of the UN Children’s Agency (UNICEF) Anthony Lake said late last night. In the joint statement, the officials “strongly condemn” attacks on health and any other civilian facilities in Syria and added that they are “deeply concerned by the serious implications for patients, health personnel and provision of critical medical supplies”. Over 60 per cent of public hospitals are not functioning in Syria and a similar percentage of ambulances stolen or damaged, according to UN figures. “At a time when hospitals are overwhelmed with patients, it is vital that these facilities be protected and medical staff be allowed to provide urgent medical, surgical and obstetric care to patients without any risk,” the officials said. They noted that attacks against health facilities can be considered a war crime under international law. “All parties must respect their obligations under international humanitarian law to protect civilians, health facilities and health professionals,” they urged. Despite the insecurity and serious access challenges the UN and partners have helped vaccinate more than 3.3 million children against measles and polio in recent weeks, according to figures provided by the UN Office for the Coordination of Humanitarian Affairs (OCHA). Meanwhile, over 8,000 women have received reproductive and maternal health services, the UN agency said, and hundreds of thousands of people with chronic health problems are being treated with medical supplies and training provided by the UN and partners. The statement also deplored the escalating violence in a conflict that has killed more than 100, 000 people and driven some 6.5 million others from their homes since opposition protesters first sought to oust the Government of President Bashar al-Assad in March 2011. On Tuesday, Ms. Amos briefed the UN Security Council behind closed doors on challenges to humanitarian access in the war-torn country. She said that despite “modest progress” with the Government on speeding up visa issuance and increasing the number of relief distribution hubs, perhaps 250,000 Syrians remain cut off from aid. A man gestures at a site hit by what activists say was an air raid from forces loyal to Syria’s President Bashar al-Assad in Raqqa, eastern Syria Dec. 7, 2013. Syrian regime fighter jets also pounded a rebel-held city in the country’s northeast, killing at least 12 people including five children, activists said. The Britain-based Syrian Observatory for Human Rights reported that the air raids hit the northeastern city of Raqqa early afternoon. Four women were among the dead and dozens of people were wounded, the Observatory said. Rebels captured Raqqa, the capital of the province of the same name, in March. It’s the only major urban center to fall entirely under opposition control since the Syrian conflict began in March 2011. Rebels also control territory in the north and parts of Aleppo, Syria’s largest city and its commercial center. President Bashar Assad’s forces have relied heavily on air power in the last year to regain control of opposition-held territory, particularly in the north and along the border with Turkey. Activists say airstrikes often precede government ground offensives. Assad’s troops may be mounting a major operation to recapture territory and bolster its position ahead of peace talks planned for January in Geneva. Divisions between rebel factions and the increasing influence of radical Islamists in the rebel ranks have strengthened Assad’s position in the more than years of civil war. The Western backed Syrian Free Army (FSA) announced on Saturday that two of its commanders were killed by the al-Qaeda linked Islamist State of Iran and Syria (ISIS). The two commanders, Mohammad al-Qadi and Ahmad Jahar, were abducted while leading an aid convoy from Turkey to northern Syria. They were reportedly seen last at an ISIS camp in the town of Azaz, but a day later their bodies were found by residents in the outskirts of Azaz. Some residents said they were baffled by the “secret execution” of the two men. One resident said the al-Qaeda group usually puts individuals on trial and then executes them publically. “Secret executions are not part of al-Qaeda’s style,” one resident said. Meanwhile, fighters from the Islamic Front, a union of six major rebel groups, took control of the Free Syrian Army (FSA) bases at the Bab al-Hawa crossing on the northwestern border with Turkey late on Friday night, the opposition sources said. Louay Meqdad, an FSA spokesman, said the Islamic Front fighters had entered the bases after saying they wanted to help to secure them. They then asked officers and employees to leave and replaced an FSA flag with one of their own, he said, according to Reuters. “We believe that those brigades are our brothers, that they know that we are not the enemy,” Meqdad said. Infighting among Syria’s rebel groups has undermined their fight against President Bashar al-Assad in the 2-1/2-year-old civil war and made Western governments hesitant to back them.